Pra Somdej Song Krut Hlang Roop Muean Ayu Wattana 90 Edition released in 2555 BE Blessed by Luang Phu Kambu. The amulet features a Buddha riding Garuda with Luang Phu on rear face. A Classic and Highly Sought After amulet from the great deceased master monk Luang Phu Kambu Kudtajidto, of Wat Gut Chompoo. The front face of the amulet bears the classic image of the Pra Somdej Buddha on a three tiered dais, with Paya Krut (Garuda) emblazoned on the dais/Throne of the Buddha, painted gold. A piece of sacred Pratat relic is inserted as Muan Sarn into the chest of the Buddha-Rupa image. The topknot of the Buddha is plump but flared and tapers out before touching the top of the arch. The dais is a ‘Thaan Hmorn’ (cushion shape) throne. A piece of Sacred Pratat Muan Sarn is inserted within the Sacred Clay of the chest of the Buddha. 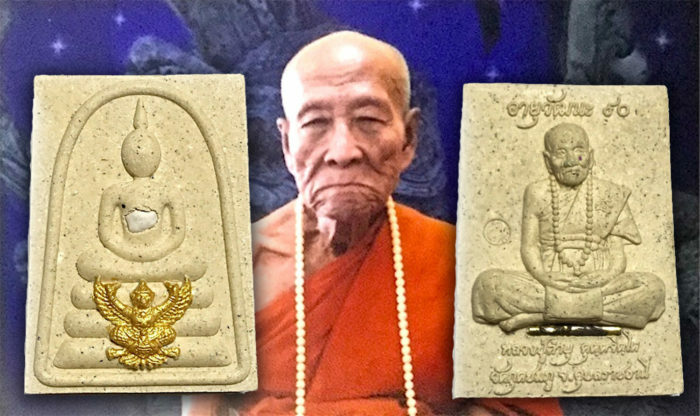 Luang Phu Kambu was an Arya Sangha whose magic power goes unquestioned, as well as his correct and diligent practice of the Vinaya making his purity an essential aspect of the miracle power of his amulets. The rear face of the amulet bears the image of Luang Phu Kambu seated in meditative poise and Series Code Stamp embossed to the right of Luang Phu. The name of the edition is embossed on the top with the words ‘Ayu Wattana’. Those who know and revere Luang Phu Kambu, will also have this as another reason, for wearing, believing in, and praying to this amulet. Luang Phu Kambu, has now passed away, and his amulets have entered the extreme collector classification. We advise collectors and speculators as well as devotees ofLuang Phu, to keep your LP Kambu amulets safely guarded, for they can now only increase in value and become one day sure rarities of high esteem and immense value, and price. They are now more than ever, beyond doubt as classic amulets, from a great Monk of Purity, and the future of his amulets is assured to be auspicious, long, and higly regarded in the collector scene.